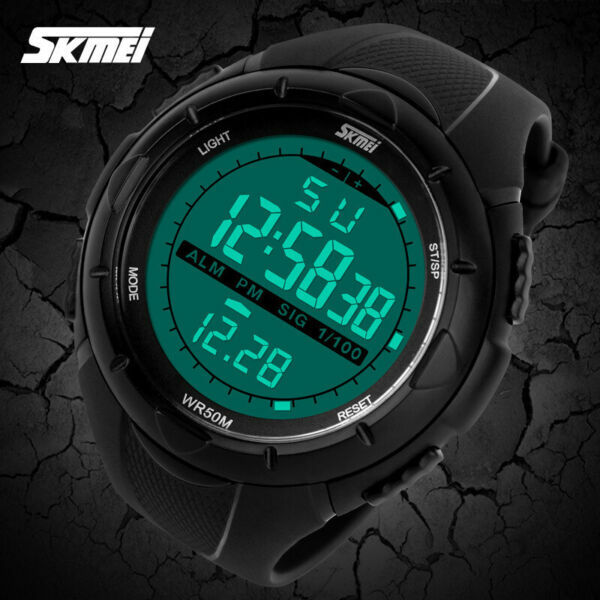 eBay Features:100% Brand New and Good QualityBrand: SKMEI (Authorized)Watch Case is made of high quality PCWatch band made of high quality PU RubberCool and Stylish design; ideal for sporting/Hiking/CyclingDigital Time display: Seconds, minutes, hour, day, date and month display.3 modes: Time, Alarm and ChronographHigh quality LED Back light Night vision design50M Waterproof: there is no need to take off the watch while swimming or cleaning your car. (Note: Do not use any button to set the watch while under water and avoid hot water)Watch Case Diameter: 55mmThickness: 15mmMin. wrist circumference: 175 mmMax. wrist circumference: 225 mmWatch Band Width: 20mmColor: BlackNice and warm gift for yourself and your friends.Quantity: 1pcsIn shipping package:1 x Digital Watch Shipping: 1.How much is the shipping & handling (S&H)? Our shipping and handling charges are clearly stated in the Shipping and Payments section of the item page, and we provide Free Shipping for most items. 2.For multiple purchases, the combine shipping discount will be automatically calculated when you check out and pay all of your purchases together. Items checked out separately may not be combined and the combine shipping discount will not be offered automatically. 3.Please make sure the correct Ship-To address is entered before checking out. Once the payment is completed, you may not be able to change the shipping address. We shall not be held responsible for any wrong or undeliverable addresses. 4.We usually ship within 1-2 business days of receiving cleared payment. 5.The package will be shipped from the item location to your address via postal airmail services. 6. The regular Registered Airmail service will be listed as "Standard Int'l Shipping" or "Standard Shipping from outside US". We'll upload the tracking number to eBay once the package is shipped. You may track your package online at the original or destination postal services' website. "Standard Int'l Shipping" or "Standard Shipping from outside US" will normally arrive in 6 -11 business days but sometime goes up to 25-30 business days for remote areas. "ePacket delivery" is an eBay recommended shipping service for small packets below two kilos, it's faster than regular Airmail service and has full track-and-trace ability. Economy Int'l Shipping is the most economic international shipping service but no tracking number will be provided. Expedited Int'l Shipping is the fastest shipping service, tracking number will be uploaded to eBay once package is shipped. You may contact us for shipping your item using your most desirable expedited shipping service, we'll try our best to help but you will be responsible for the shipping charge. 7. You, as the buyer, are responsible for the import duty and/or VAT for items bought from abroad. We have no idea about your local import duty or VAT or any import regulations or restrictions at the destination countries, and we shall not be held responsible for providing this information to buyers. If you have any questions in these respects, we strongly suggest that you check with your local authorities for details before purchases. Payment: 1. This is the payment method we can accept: Paypal 2. You can checkout and pay immediately after the auction ends or you complete the purchases. If you need an eBay invoice sent to you by Email, please contact us before making payments. 3.Once the checkout is completed, you will not be able to include any additional purchases. We start to process and fulfill your order once payment is received. New purchases after the checkout will be processed separately. 4. Payments are expected within 4 days after the order is confirmed. Unpaid item (UPI) strike may be filed with eBay upon non-receipt of payment. Returns: 1. We put buyer's satisfaction at top priority. If you're not pleased with your purchases, we'll be happy to make an exchange or refund the item total price less Shipping and Handling (S&H) charges within 30 days of your purchases. 2. For any Exchange, Refund or Return, the item must be in its original condition, including the box, packaging, and all the accessories or gifts. 3. We'll provide prepaid return shipping label if the return is a result of our error. Postage reimbursement is offered only on standard mails, and it needs to be approved by our staff prior to returning. 4. Please allow up to 7 business days for returns to be processed. 5. Shipping and Handling (S&H) charges are not refundable. Feedback: We put buyers's satisfaction at our top priority and we hope all buyers enjoy good buy experience with us. If you received your item and you are satisfied with it. Please leave a positive feedback. If for any reason you are not satisfied with us, please contact us via ebay message, we'll try our best to resolve the problem with you. Contact us: 1. Customer satisfaction is very important to us and our feedback rating reflects this satisfaction. If you have any question or concern, please contact us via eBay message. 2. We respond to all eBay messages as quickly as possible. Though your question will usually be answered very soon, please allow us up to one business day before you start thinking your message is neglected or the reply is avoided, because there would be time difference, non-working hours or public holidays that have prevented us from making an instant response. FAQ: 1.Q: How do I pay for my purchase? A: We accepts the following payment method: Paypal. 2.Q: When will the item be shipped out? A: The item will be shipped within 1 business day once we received cleared payment. 3.Q: Where do you ship from? A:Please just check the location of the listing. 4.Q: How do I return an item? A:We accepts returns. Items must be returned within 30days. Refunds will be given as money back. Please contact our customer service via ebay message before you return a item. 5.Q: How to solve the problem of losing package? A:We will resend a new item or give a refund to you as compensation once we confirm the problem. 6.Q: Where is my tracking number? A: Please log on your account. Click "my ebay"---"my summary", or open your emailbox and find the shipping notification email. Case,Cover & Skin Bluetooth Headset Wristwatchs Cellphone Lens Kitchen Tools On Sales Clearance Knee Wrap Support 12.59 $ Apple Watch Case Strap 9.99 $ Mens Digital Watches 11.99 $ Our Store iPhone 6 & Plus Case iPhone 7 plus Case iPhone 5 se Case iPad Mini Case iPad Air Case Note 5 Case Galaxy S8 Case Galaxy S7/Edge Case Galaxy 6/Edge Case Galaxy Tab Case LG G6 Case Google Nexus Case Charger & Cables Mount & Holder Headset Jewelry & Watches Home Garden Wholesales Features:100% Brand New and Good QualityBrand: SKMEI (Authorized)Watch Case is made of high quality PCWatch band made of high quality PU RubberCool and Stylish design; ideal for sporting/Hiking/CyclingDigital Time display: Seconds, minutes, hour, day, date and month display.3 modes: Time, Alarm and ChronographHigh quality LED Back light Night vision design50M Waterproof: there is no need to take off the watch while swimming or cleaning your car. (Note: Do not use any button to set the watch while under water and avoid hot water)Watch Case Diameter: 55mmThickness: 15mmMin. wrist circumference: 175 mmMax. wrist circumference: 225 mmWatch Band Width: 20mmColor: BlackNice and warm gift for yourself and your friends.Quantity: 1pcsIn shipping package:1 x Digital Watch	Shipping: 1.How much is the shipping & handling (S&H)? Our shipping and handling charges are clearly stated in the Shipping and Payments section of the item page, and we provide Free Shipping for most items. 2.For multiple purchases, the combine shipping discount will be automatically calculated when you check out and pay all of your purchases together. Items checked out separately may not be combined and the combine shipping discount will not be offered automatically. 3.Please make sure the correct Ship-To address is entered before checking out. Once the payment is completed, you may not be able to change the shipping address. We shall not be held responsible for any wrong or undeliverable addresses. 4.We usually ship within 1-2 business days of receiving cleared payment. 5.The package will be shipped from the item location to your address via postal airmail services. 6. The regular Registered Airmail service will be listed as "Standard Int'l Shipping" or "Standard Shipping from outside US". We'll upload the tracking number to eBay once the package is shipped. You may track your package online at the original or destination postal services' website. "Standard Int'l Shipping" or "Standard Shipping from outside US" will normally arrive in 6 -11 business days but sometime goes up to 25-30 business days for remote areas. "ePacket delivery" is an eBay recommended shipping service for small packets below two kilos, it's faster than regular Airmail service and has full track-and-trace ability. Economy Int'l Shipping is the most economic international shipping service but no tracking number will be provided. Expedited Int'l Shipping is the fastest shipping service, tracking number will be uploaded to eBay once package is shipped. You may contact us for shipping your item using your most desirable expedited shipping service, we'll try our best to help but you will be responsible for the shipping charge. 7. You, as the buyer, are responsible for the import duty and/or VAT for items bought from abroad. We have no idea about your local import duty or VAT or any import regulations or restrictions at the destination countries, and we shall not be held responsible for providing this information to buyers. If you have any questions in these respects, we strongly suggest that you check with your local authorities for details before purchases. Payment: 1. This is the payment method we can accept: Paypal 2. You can checkout and pay immediately after the auction ends or you complete the purchases. If you need an eBay invoice sent to you by Email, please contact us before making payments. 3.Once the checkout is completed, you will not be able to include any additional purchases. We start to process and fulfill your order once payment is received. New purchases after the checkout will be processed separately. 4. Payments are expected within 4 days after the order is confirmed. Unpaid item (UPI) strike may be filed with eBay upon non-receipt of payment. Return: 1. We put buyer's satisfaction at top priority. If you're not pleased with your purchases, we'll be happy to make an exchange or refund the item total price less Shipping and Handling (S&H) charges within 30 days of your purchases. 2. For any Exchange, Refund or Return, the item must be in its original condition, including the box, packaging, and all the accessories or gifts. 3. We'll provide prepaid return shipping label if the return is a result of our error. Postage reimbursement is offered only on standard mails, and it needs to be approved by our staff prior to returning. 4. Please allow up to 7 business days for returns to be processed. 5. Shipping and Handling (S&H) charges are not refundable. Feedback: We put buyers's satisfaction at our top priority and we hope all buyers enjoy good buy experience with us. If you received your item and you are satisfied with it. Please leave a positive feedback. If for any reason you are not satisfied with us, please contact us via ebay message, we'll try our best to resolve the problem with you. Contact US: 1. Customer satisfaction is very important to us and our feedback rating reflects this satisfaction. If you have any question or concern, please contact us via eBay message. 2. We respond to all eBay messages as quickly as possible. Though your question will usually be answered very soon, please allow us up to one business day before you start thinking your message is neglected or the reply is avoided, because there would be time difference, non-working hours or public holidays that have prevented us from making an instant response. Shipping: 1.How much is the shipping & handling (S&H)? Our shipping and handling charges are clearly stated in the Shipping and Payments section of the item page, and we provide Free Shipping for most items. 2.For multiple purchases, the combine shipping discount will be automatically calculated when you check out and pay all of your purchases together. Items checked out separately may not be combined and the combine shipping discount will not be offered automatically. 3.Please make sure the correct Ship-To address is entered before checking out. Once the payment is completed, you may not be able to change the shipping address. We shall not be held responsible for any wrong or undeliverable addresses. 4.We usually ship within 1-2 business days of receiving cleared payment. 5.The package will be shipped from the item location to your address via postal airmail services. 6. The regular Registered Airmail service will be listed as "Standard Int'l Shipping" or "Standard Shipping from outside US". We'll upload the tracking number to eBay once the package is shipped. You may track your package online at the original or destination postal services' website. "Standard Int'l Shipping" or "Standard Shipping from outside US" will normally arrive in 6 -11 business days but sometime goes up to 25-30 business days for remote areas. "ePacket delivery" is an eBay recommended shipping service for small packets below two kilos, it's faster than regular Airmail service and has full track-and-trace ability. Economy Int'l Shipping is the most economic international shipping service but no tracking number will be provided. Expedited Int'l Shipping is the fastest shipping service, tracking number will be uploaded to eBay once package is shipped. You may contact us for shipping your item using your most desirable expedited shipping service, we'll try our best to help but you will be responsible for the shipping charge. 7. You, as the buyer, are responsible for the import duty and/or VAT for items bought from abroad. We have no idea about your local import duty or VAT or any import regulations or restrictions at the destination countries, and we shall not be held responsible for providing this information to buyers. If you have any questions in these respects, we strongly suggest that you check with your local authorities for details before purchases. Payment: 1. This is the payment method we can accept: Paypal 2. You can checkout and pay immediately after the auction ends or you complete the purchases. If you need an eBay invoice sent to you by Email, please contact us before making payments. 3.Once the checkout is completed, you will not be able to include any additional purchases. We start to process and fulfill your order once payment is received. New purchases after the checkout will be processed separately. 4. Payments are expected within 4 days after the order is confirmed. Unpaid item (UPI) strike may be filed with eBay upon non-receipt of payment. Returns: 1. We put buyer's satisfaction at top priority. If you're not pleased with your purchases, we'll be happy to make an exchange or refund the item total price less Shipping and Handling (S&H) charges within 30 days of your purchases. 2. For any Exchange, Refund or Return, the item must be in its original condition, including the box, packaging, and all the accessories or gifts. 3. We'll provide prepaid return shipping label if the return is a result of our error. Postage reimbursement is offered only on standard mails, and it needs to be approved by our staff prior to returning. 4. Please allow up to 7 business days for returns to be processed. 5. Shipping and Handling (S&H) charges are not refundable. Feedback: We put buyers's satisfaction at our top priority and we hope all buyers enjoy good buy experience with us. If you received your item and you are satisfied with it. Please leave a positive feedback. If for any reason you are not satisfied with us, please contact us via ebay message, we'll try our best to resolve the problem with you. Contact us: 1. Customer satisfaction is very important to us and our feedback rating reflects this satisfaction. If you have any question or concern, please contact us via eBay message. 2. We respond to all eBay messages as quickly as possible. Though your question will usually be answered very soon, please allow us up to one business day before you start thinking your message is neglected or the reply is avoided, because there would be time difference, non-working hours or public holidays that have prevented us from making an instant response. FAQ: 1.Q: How do I pay for my purchase? A: We accepts the following payment method: Paypal. 2.Q: When will the item be shipped out? A: The item will be shipped within 1 business day once we received cleared payment. 3.Q: Where do you ship from? A:Please just check the location of the listing. 4.Q: How do I return an item? A:We accepts returns. Items must be returned within 30days. Refunds will be given as money back. Please contact our customer service via ebay message before you return a item. 5.Q: How to solve the problem of losing package? A:We will resend a new item or give a refund to you as compensation once we confirm the problem. 6.Q: Where is my tracking number? A: Please log on your account. Click "my ebay"---"my summary", or open your emailbox and find the shipping notification email. About US | Newsletter | Feedback | Contact Us Copyright 2017 ocestore. All rights reserved.